Both my wife and I have been intermittent fasting for years. Let me tell you about what I've learned. "Paul, do you intermittent fast?" And yes, I fast and have been fasting most every single day and have been practicing intermittent fasting for about 4 years now. And as an athlete, trainer, fitness enthusiast, and advocate for conscious and healthy living, it's not just some sort of "crash diet," but has become a lifestyle choice and something I implement in my daily/weekluy life regardless of my training goals. This blog post is a long time coming, so I figured I'd take the time to talk about it as it's something that has been a keystone in my health; and what I believe to be a part of me being the healthiest version of myself to date. Although I'm about to talk about my own journey and all its benefits, I don't believe everyone should immediately start fasting for long periods of time or every day. There's a process and an adjustment period that if not done correctly and with proper knowledge on the subject, can deter one from experiencing its benefits without even really getting started. There's a lot more research that needs to be done for any individual, and at this time I won't provide much in this blog post --just my own experience. Being said, if fasting is something you'd like to talk more about, just as I have talked with many others about it and through it with much success, please feel free to ask. I also don't straight up recommended it out there first hand because I don't want people thinking the could just incorporate fasting without taking necessary steps first to getting into the right habits of what they are consuming regardless of when they choose to eat. With all the benefits with Intermittent fasting, Fasting is still not the foundation to healthy diet... but it is a good supplemental protocol to a healthy diet to make it even better. If you don't have a good foundation of nutritional needs and good eating habits, then you can potentially do yourself a disservice in the long run. You "can't put perfume on sh*t."
Again, Intermittent fasting is NOT a diet. It's a form of eating. Your diet is the nutritional choices you make of what goes in your body. I'm not saying fasting is "THE BEST" way to reach body composition goals. You you can achieve whatever goals you have eating whenever you want with a better understanding of food and your body to a nutrient and hormonal level. Whether you eat 3 times a day, 6 times a day, or once a day, I am a firm believer that if you were to eat natural proteins, low glycemic foods that don't spike blood sugar too high and insulin along with it, and a lot of nutrient dense vegetables, you'd be more than just fine. Finally, my final disclaimer is my main point- I do believe people should incorporate some of the many various forms of fasting in their lives. If you believe that to be some heresy to the fitness world, I hope you proceed through this post with an open mind or refrain from reading. I could list a bunch of more, but let me tell you what I've learned from 3 years of intermittent fasting. 12 hours of fasting, as this is typically how long it takes to get into a fasted state after your last meal. 16 hours of fasting and 8 hours of eating, due to research-proven data of the benefits of what happens to your body at approximately that 16 hour window. 20 hour fasting and 4 hours of eating, as said benefits continue to accelerate during prolonged fasting periods. 5:2... Eating your normal caloric intake 5 days out of the week and restricting calories 2 days. Extended fast for multiple days on end. The variables of how often one can or should fast are dependent on the individual, their goals, their medical history, lifestyle, and their overall preference. Some sources of information you can look into are THE OBESITY CODE, THE WARRIOR DIET, EAT STOP EAT, and the LEAN GAINS METHOD. The theory behind fasting is that you're allowing your body to give it's digestive system a break because we're not meant to be consuming so much throughout the day. And when you allow yourself to fast, you're allowing your body to cleanse itself and produce energy from itself rather than your dietary intake. Fasting is a normal medical practice, an age old spiritual and religious practice, and has recently become very popular in the mainstream fitness world over the past couple years. Back when I came across fasting for fitness years ago, there weren't many resources on fasting for athletes and cross training, but as studies continue to emerge, it's become a larger part of the conversation as people from different ends of the fitness world practice it, talk about it, argue against it, and debate it. With all being said, I'm not here to argue against anyone, as I am here to talk about my own positive experience with intermittent fasting as I've spent 3 years researching, testing, applying, adjusting, adapting, and evolving through intermittent fasting. I have to give this disclaimer because you'll hear a lot of word of mouth against fasting without knowledge or grounded research or even personal experience, BUT YOU'LL ALSO HEAR A LOT OF PEOPLE ARGUING FOR FASTING without the same grounded experience or research and doing it just because it's something they heard of from a friend or, well, like a blog like this one. What I'm trying to say is, the best research done is the one you do yourself. Take what I say and what others say with a grain of salt. Take it as a perspective. Let it open up your curiosities, not being restricted to judgements based on what you think you know about the world and the human body. Let what I say here be something that opens you up to more learning, that this is just a window of opportunity to understand something you might not know much about. I am by no means giving an expert opinion and all there is to know on the subject. Just my own personal experience. I wrote this in my last post, but I used to be overweight due to a stressful corporate marketing job and overeating. I've always been into fitness, but fell off in terms of my diet. So I went in on a journey to figure out how to get my nutrition back in check. I started tracking my macro nutrients and caloric intake which was a good start, and started eating frequently throughout the day because people in the gym I used to train at said so. That's all, just because they said so, and that was the common train of thought. So that's what I did. I went to work with a huge lunch box with a bunch of tupperware of food all measured out for me to eat all day. But I was working a corporate desk job at the time and although I would train either in the morning or night or even both, it didn't make sense to me to be eating throughout the day when I wasn't doing anything. Eating became stressful. I was always hungry. People will tell you that this is because your "metabolism is firing" and you have to keep feeding it to keep burning it. Which at the time didn't make sense (and is actually a myth!) because I thought, although there is a thermogenic effect of food because of the body's energy needs to digest it, aren't I still just putting more calories in my body? And also, how many calories am I burning overall with me just working my job sitting at my desk? It didn't seem right to just keep feeding my body, but I definitely was hungry, watching the clock until my next feeding time. Later I would find out this was all due to hormones, that I wasn't really "going into starvation mode," but in truth, just the effect of training my body to eat at certain times. When you do so, and your body doesn't get what it expects, it releases ghrelin, the hunger hormone, saying "EAT EAT EAT." Now if you can control your overall caloric intake, this is somewhat okay, but every time you eat, your blood sugar levels rise, your insulin levels spike, then in a short while it dips, and then you want to eat again. It's a cyclical process of just wanting to eat again. Which can be stressful and overbearing and for me, unnecessary. It's also not ideal, especially in relatively unhealthy people, as you never seem to get your blood sugar and insulin levels stabilized. We want to increase our INSULIN SENSITIVITY, our body's ability to shuttle nutrients when we do eat to where it needs to go; a process that fasting has been proven to improve. Constantly eating and overeating decreases insulin sensitivity and can enable INSULIN RESISTANCE, storing what you eat as fat to be used for energy later. So eating every couple hours wasn't really working for me, and I was losing weight very slowly, and felt like I could accelerate the process more. So I started reading and came across Intermittent fasting... slowly adjusting to fasting 16 hours a day and eating the other 8 hours. At the time, I found just a few resources on fasting for athletes and bodybuilders, but I also started reading articles and medical research on the topic, tests on some humans and animals, fasting as a spiritual practice, and discovered all these benefits about fasting extending FAR BEYOND just weight loss. Research proven spikes in Human Growth hormone, naturally produced by the pituitary gland which in a nutshell, burns fat, spares protein, and spares muscle. As a person with a close family history of diabetes, obesity, kidney failure, heart failure, liver failure, and cancer, with my father and aunt (his sister) just recently passing away from all of the above, all the benefits above have resulted in me naturally choosing fasting as a regular lifestyle. There isn't any comparable research saying fasting is bad for you...or even research saying that eating often and all day provides any type of similar benefits to the body as listed above, so my choice is easy. 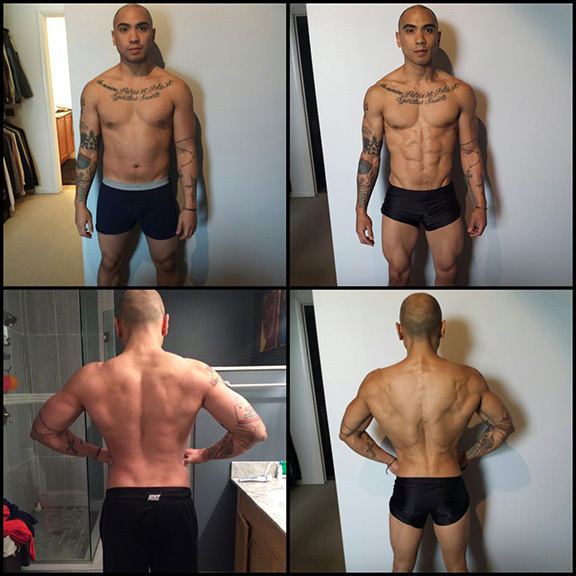 Like most articles you'll find on the internet, I can talk about all the benefits and talk about research, but getting back to my initial 2015 story: During this time my friends and I decided to do a challenge where we measure each other's body fat using skin calipers and try to lose the most body fat percent loss within X amount of time. During the competition, I tracked my Macros and caloric needs, adjusted my calories and carbohydrates week by week, and intermittent fasted almost ALMOST everyday for about 16 hours. The next picture shows a 3 month change from 195 pounds to 170 pounds, losing 25 pounds and gaining muscle while intermittent fasting. I then continued to keep fasting for the rest of 2015 and maintain and develop my physique. As 2016 rolled through and my friends wanted to do another competition, so I intentionally gained as much weight as I could, going up to 181 pounds and followed the same fasting protocol: the pictures below are at the start and end of the competiotion. 3 months apart, dropping down to 167. leaner than the end of the competioion the year before. Fast forwards to 2018. Last year I finished my first IRONMAN in the fall of 2017 and I had spent all year eating a ridiculous amount of calories to train, and then after the Ironman it was a bit of a struggle to get my caloric intake back in check with a much lower activity level. So i had gained a bit of weight over the winter and gained more weight intentionally while training heavy for mass for yet another little friendly competition with my friends. So for the competition, I set out to do some strict dieting while still fasting. The first picture, 185 pounds, the third- 177. What's most interesting between the three pictures up top is that during this time, I also BURNED FAT, GAINED MUSCLE, AND INCREASED STRENGTH all while intermittent fasting. My olympic lifts got stronger, my bench press increased, and my endurance improved. Also, because my goals were to lean down, I put myself in a caloric deficit from my basal daily energy expenditure, and if I were training for more size, I would change my caloric and training strategies. Fasted almost every single day anywhere between 14-24 hours. Variables depending on schedule, training and caloric needs. 90 percent of my training is done in the morning fasted. That includes cardio, cross training, bootcamps, HIIT workouts, Olympic lifting, Strength training, Hypertrophy workouts, long runs, short sprints, aka- everything. Sometimes I'll take a caffein supplement beforehand, but never anything after. I just make sure I eat enough protein throughout the week and at night. I used to supplement branch chain amino acids in the morning, but haven't as of this year. While I'm fasting, I only drink water, black coffee, and tea. Overall i eat a very low carbohydrate diet throughout the week. But on the weekends I "carb cycle" and eat complex carbs to replenish my glycogen stores. Depending on my training goals, I'll eat carbs throughout the week, a small amount, just around my afternoon training sessions (which are during my feeding window). But if I don't feel like I need them, I won't eat them. It's just something I've learned to feel out hormonally throughout the years. Sometimes I would fast 24 hours. Once a week or every other week. Once in a while I would do a 20 hour dry fast, not taking in any water or food. NOTE, I'll write more on this another time, but do not do this without proper preparation or research. I'm just starting this because I'm explaining all that I did. I ate anywhere between .5 to .8 grams of protein per body pound each day... more so on the lower end of the scale, raising it depending on how hard I was training around that time of the week. Fasting combined with a low carbohydrate diet actually helps spare protein and lower requirements due to processes related to autophogy and the recycling of amino acids. The rest of my calories were made up of greens and healthy fats. For me, fats take up the caloric volume, greens take up the spacial volume, and I always try to get most of my protein from real animal or plant based sources, supplementing with a protein powder MAYBE once a day just to give my green smoothies a little flavor. I eat a TON of vegetables. Just a part of what a usual day looks like for me. I have to say this one again: I feel best when I make sure that fats take up the caloric volume, vegetables take up the spacial volume, and I always hit my protein requirements. Get your micronutrients and trace minerals. This is key to help the body run efficiently. For me, carbs are not a necessity to life, but can be a necessity to training depending on my training goals. If you treat it as so, you learn how to use carbs for your needs, not just something to eat on a regular basis just because it's available or you think it fills you up i.e., cereal bars, energy bars, granola, etc. I'm not saying there isn't a place for carbs, but I do believe in timing them and eating them in moderation. And of course, also eating the RIGHT KIND of carbohydrates. Whether you eat 3 times a day, 6 times a day, or once a day, I am a firm believer that if you were to eat natural proteins, low glycemic foods that don't spike blood sugar too high and insulin along with it, and a lot of nutrient dense vegetables, you'd be more than just fine. 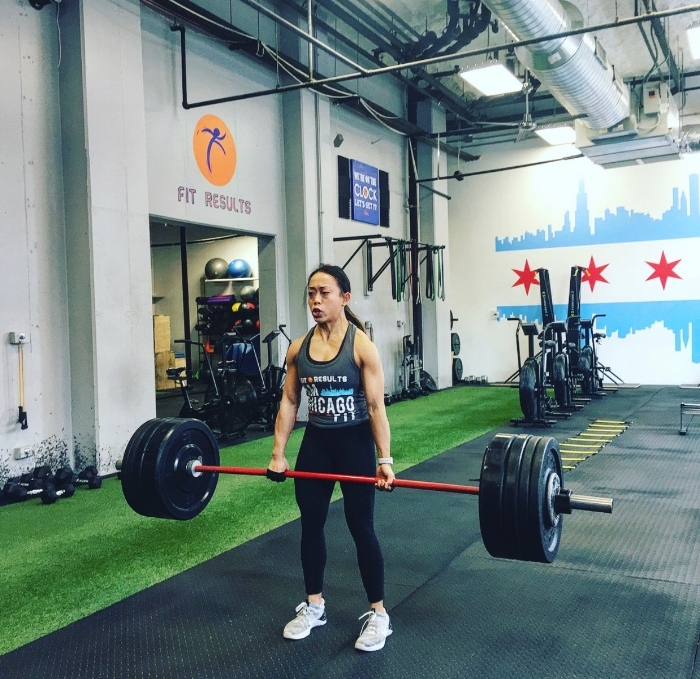 Of all the amazing things she's done, here she is, in a fasted state, hitting her PR one rap max deadlift not too long ago April 2018. The big "word of mouth" argument against fasting is that intermittent fasting is starving yourself, you'll eat up your muscle, slow your metabolism, and its counterintuitive to performance and muscle growth. But I, along with many others have found that FASTING DOES NOT EAT MUSCLE AND YOU DON'T GO INTO STARVATION MODE FROM NOT EATING AS OFTEN AS MOST PEOPLE THINK YOU SHOULD. The body is adaptable. The body is resilient. It will do what it needs to do to maintain it's strongest form. Fasting has been proven to release hormones (Human Growth Hormone) that SPARE PROTEIN and MOBILIZE FAT CELLS to be used as energy. People tend to think that fasting will just make you hungry all the time, but it actually gets your hunger back in check, and you become less hungry (after an adjustment period) and are better able to deal with the times when you are (actually) hungry. Today, I regularly eat twice a day, sometimes once, fasting usually between 14 and 24 hours almost every day, training fasted in the mornings, not eating after my morning training sessions, and have been able to GROW MUSCLE and GAIN STRENGTH. I pretty much always hit my caloric needs throughout the week. When I eat, I eat with the intention of nourishing my body with everything it needs. Macronutrients and Micronutrients included. It's not about calories in a day. It's about calories in a week. You're not starving yourself. You're still eating. Just when your body needs it. If done properly, meaning you're getting all your nutrient needs, your body is just eating during a small time during the day and you're letting your digestive system give itself some much needed rest while calling upon other places in your body to get energy... specifically fat stores, sparing the protein and muscle needed to physically operate. If you keep doing what you will with your body, and fueling it properly, your body operates more efficiently and effectively. Fasting does has not inhibited my physical performance, as I ensure that I eat very well the evening before my morning training sessions, fasting the next day. Fasting does not inhibit mental performance. On the contrary, I've found (and research has shown) that as the body adapts to fasting, you begin burning fat and running on ketones and find more energy and clarity to do the things I need to do. I train, work, train others, write, and live life, all fasted. Intermittent fasting isn't about starving yourself. It's about getting your hormones back in check to better understand your actual needs. When you let go of your mental need for food, you can best understand what your actual needs are for what you're willing to do with your body. It's not about underconsumption, but practical consumption, fighting against overconsumption. So overall, I'm just debunking the said myth that your body suffers from fasting. On the contrary, my performance, physicality, mental well being, and overall health has IMPROVED while fasting regularly. If you choose to do more research on the subject, you'll hear a lot of talk about how we're not meant to eat several times a day, that our past ancestors never ate in such a way, and that even eating three meals a day was pushed onto tribal communities that only ate once or twice. You'll also hear that even now in today's American society, 3 meals a day turned into 6 meals a day or filling your days with snacks because of the food industry telling you to eat all the time. Which all may be true-- but I really I don't have a taste for, or like to preach myself, on the theoretical application of "if our ancestors did/didn't do it, we should/shouldn't do it either." But pertaining to our society today, i do see how we live in a culture that feels like we need to be consuming stuff ALL THE TIME or we're not getting the most out of our bodies. EAT THIS FOOD NOW! GET YOUR MID MORNING SNACK! GET YOUR AFTERNOON SNACK. BREAKFAST-THE MOST IMPORTANT MEAL! I myself, since the age of 18, was raised in a gym culture built by supplement industries selling me on consuming stuff ALL THE TIME in order to be the strongest version of myself. YOU NEED YOUR PREWORKOUT! YOU NEED YOUR POST WORKOUT! YOU NEED YOUR MID DAY SUPPLEMENT OR FOOD TO GET THE MOST OUT OF YOUR WORKOUT! And even during a time when now, when more research is done on the subject showing that "hey- maybe you don't HAVE to eat all the time and intermittent fasting can actually be beneficial towards your longevity," no one wants to believe it because it's hard to step outside of the box built by products, word of mouth, and old school thinking. It's a box built by money. Of course no one wants us to think that fasting is okay because there's no monetary gain from fasting. There isn't something to be sold by someone that you want to look like in fasting. There's no product in fasting. And with all the money and stress we put into our food and what we consume, of course its difficult to take in the fact that we might not need it as much as we should. But why not just let go? My biggest advice to anyone who wants to start intermittent fasting is this: If you're trying to do it for weight loss, gain muscle, or how you look on the outside.. if you're doing it just for the external, don't do it. But if you're curious to see how it might affect you internally, mentally, emotionally, maybe even spiritually-- then do some more research, ask questions, and go through the process. You really don't have much to lose, but so much knowledge to gain. Yes, I believe you can lose weight through fasting, you can gain muscle through fasting, and my experience does show that. But it shouldn't be primarily about that. For me, it's been a way for me to get in control and step out of all the noise from all the people trying to tell me and products trying to sell me on what they think is best for the human body. And I've found that fasting has been away to get in tune with my body and being able to control my hunger, learning more about myself and what it actually needs. It's been a way for me to appreciate the food I eat, be more conscious of where it comes from, how I prepare it, and how much I eat of it. It's been a way of testing myself, experimenting, understanding how different foods affect my body and my training, and it's also opened up new perspectives to what I'm able to do and how i'm able to think when I'm not controlled by food... all contributing to me currently being the best health of my life. Again, this is just my own experience. I invite you to have your own. And my experience will be different than that of the next person. And results will vary due to body mass, lean muscle mass, genetics, goals, ways of life, but that in of itself is the beauty of life and learning. Being able to take things on with a clean slate and admit that you might not know as much about the world and yourself as you think you did. If you're interested in hearing more about fasting, I recommend reading the book THE OBESITY CODE and listening to it's PODCAST, but here are some videos from some resources I follow myself. One of the videos features Dr. Fung, author of THE OBESITY CODE discussing the benefits of Intermittent fasting. Nike Zoom Elite 10 Review. Running in Nike's best all around shoe. The Art of Doing Something Different.